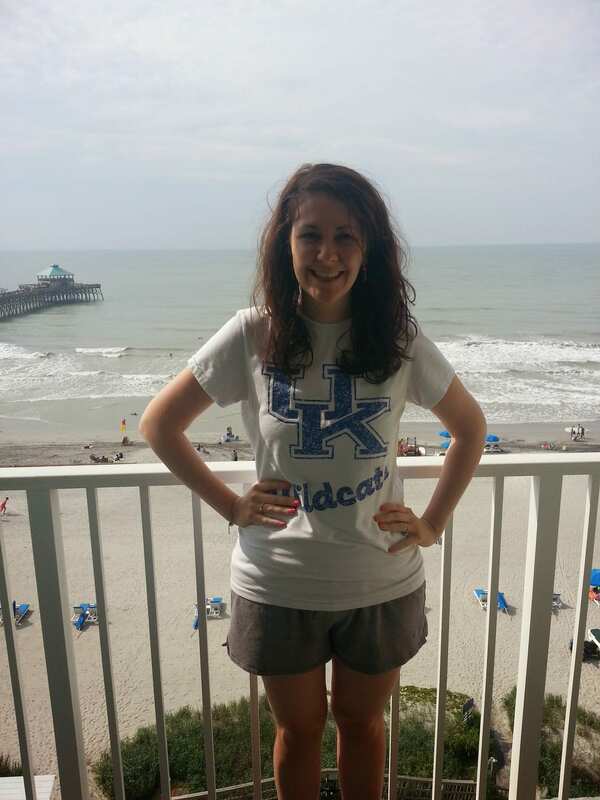 View from our balcony before we said good bye to beach–I always wear a UK shirt on the trip home! 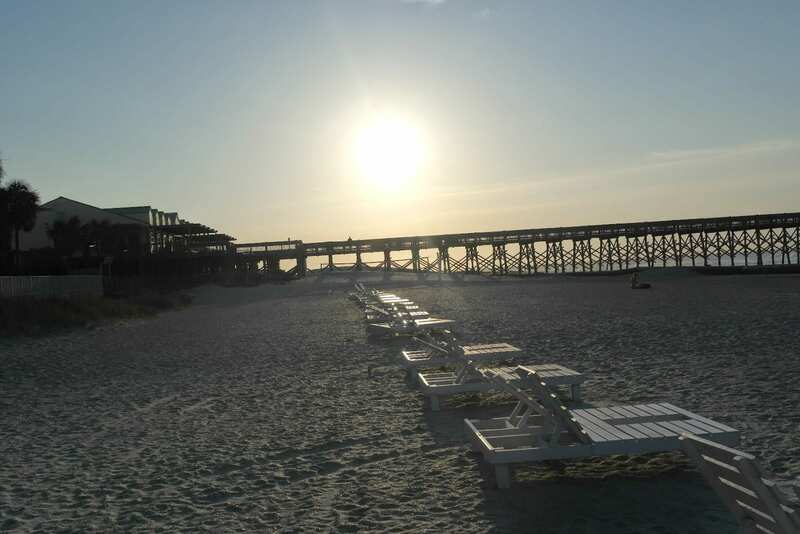 There’s a lot to share, so I’m breaking vacation talk into 2 posts- 1 about Folly Beach and 1 about downtown Charleston. We spent out days in Folly Beach and then headed into Charleston to enjoy the nightlife! We thought about going to the Dominican Republic, because we found a great deal on an all-inclusive there, but decided we didn’t want to be that far from Kane. So we started looking at places that we could get to a little easier. We decided on the Charleston, SC because it was only an 8 hour drive, close to the beach, and because of it’s awesome historical factor–what’s more romantic than swashbuckling pirate ghosts?! That said, if I’m that close to the beach, then I want to stay on it! I googled beachfront/oceanfront hotels near Charleston. 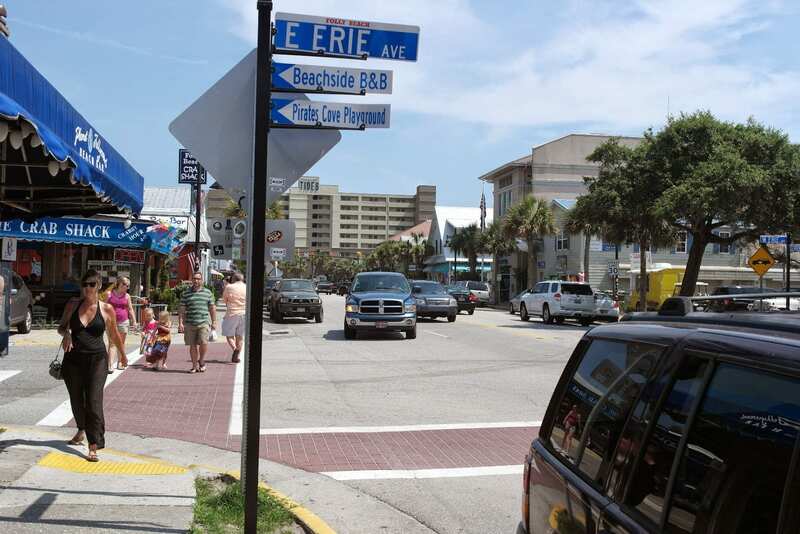 There were 3 locations with 5 hotels/resorts–Isle of Palms, Folly Beach, and Kiawah Island. I didn’t care which local we chose, so I focused more on the hotel choices. Tides Folly Beach really caught my eye. Their website describes the hotel as “Coastal Style. 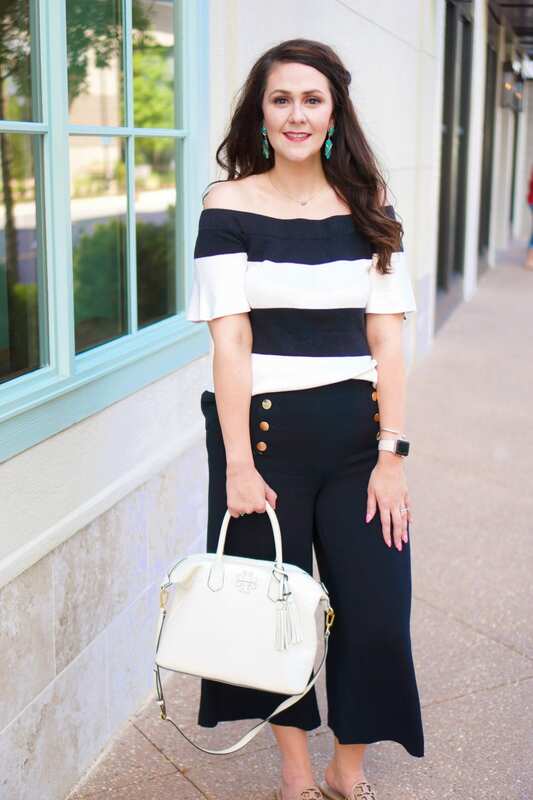 Modern Edge.” It looked boutique-y and fun! 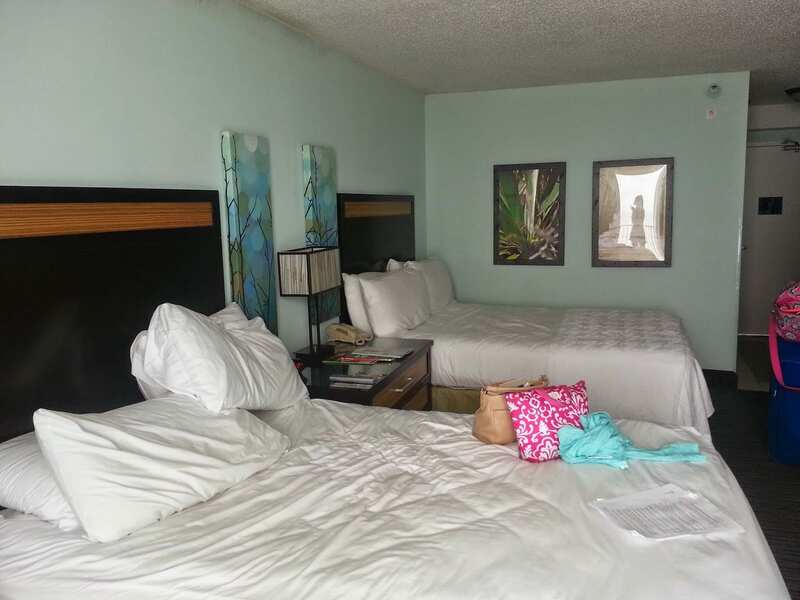 Oh yea, and EVERY ROOM IS OCEANFRONT! How awesome is that? Oceanfront rooms often come with a premium price that can hundreds of dollars to a few days stay, so that added a lot of value to the hotel. The price was right, and the location was only about 15 minutes outside of downtown Charleston, so I booked our trip! Early morning on the beach, directly in front of the hotel. Also worth noting is that the hotel is pet-friendly, just in case you’d like to take your dogs along. We stayed from Tuesday, June 10, to Saturday, June 14. The average rate for the course of our stay was $246. With the applicable taxes, the total came to around $1100. While the AAA rate ran about $40 higher for our total stay than the nonrefundable rate, we chose the AAA rate in case we needed to make any changes to our stay. This was much cheaper than The Palms Hotel (especially taking the all-oceanfront rooms into the equation), Wild Dunes, and the Sanctuary at Kiawah Island. We also rented 2 beach chairs + a beach umbrella for 3 days of our stay, which was around $25/day. The hotel is located at the dead end of Center Street, which is the main road through town. It’s within a 5-minute walk of some amazing restaurants and cute little souvenir shops. Parking is in front and to the side of the hotel. Heck, even their parking is beachfront! There’s a cute little white fence which you can walk up to and see everything from before you even get into the hotel. The hotel is in the center of this photo. Taken on Center Street. 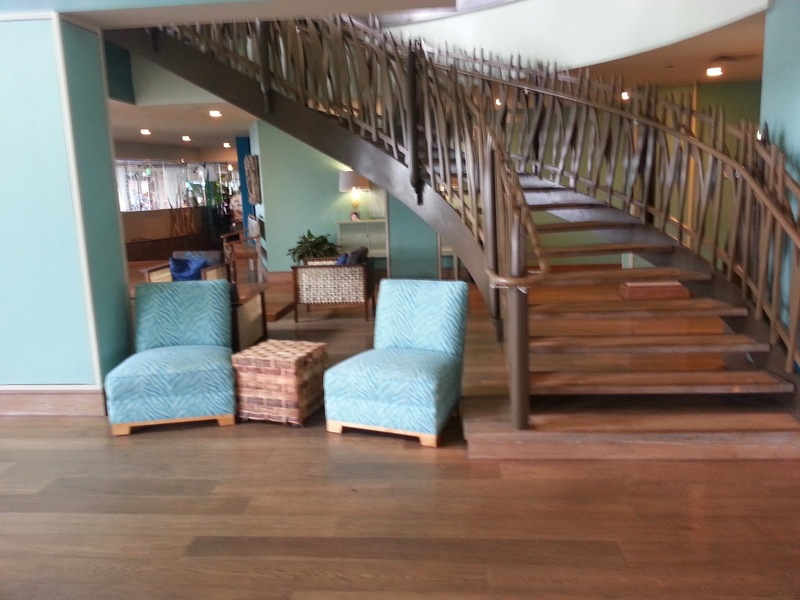 The hotel has a very modern and beachy feel to it as soon as you walk through the door. The lobby is very pretty and welcoming. It is coastal but classy. 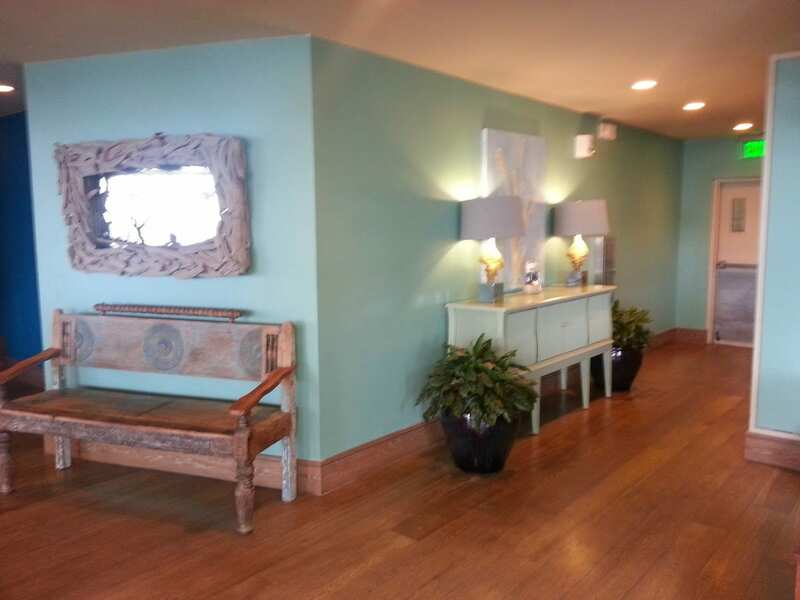 I particularly loved the shades of blue, touches of orange, and driftwood accents. The lighting is fun, with changing shades of bright colors illuminating certain areas. I instantly felt relaxed as soon as we walked through the entrance! 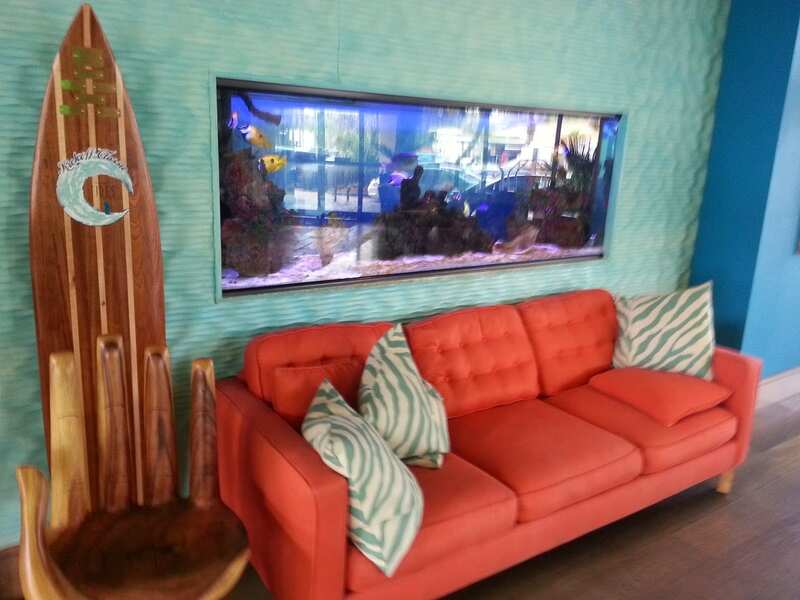 This was my favorite area of the lobby–love the orange coach with the zebra pillows and fish tank behind it! Gorgeous stairs. And you know I love those chairs too! There were 2 driftwood mirrors. I really wanted to take just 1 home! The staff was very helpful and nice. Every staff member we saw made a point to ask us how our stay was going and to chat us up! I loved the overall friendliness of this place! The room was cute and the furnishings were newer. I thought the decorations really tied in the beach without overdoing the theme. There were some areas where the paint needed touched-up, but that didn’t detract from the room or our overall experience. It’s clear that the hotel has been renovated, and I’m sure there’s some things that are still a work in progress. The bathroom was pretty typical. Should have grab a pic when we 1st arrived, instead of when we were leaving. Surprising, we didn’t actually get in the pool while we were there. The pool was an okay size, but not overly large. I really liked the lounge areas, though! They had nice chairs and loungers. The hotel offers a poolside towel service, and the hotel’s coffee shop, Roasted, is directly accessible from the pool area. 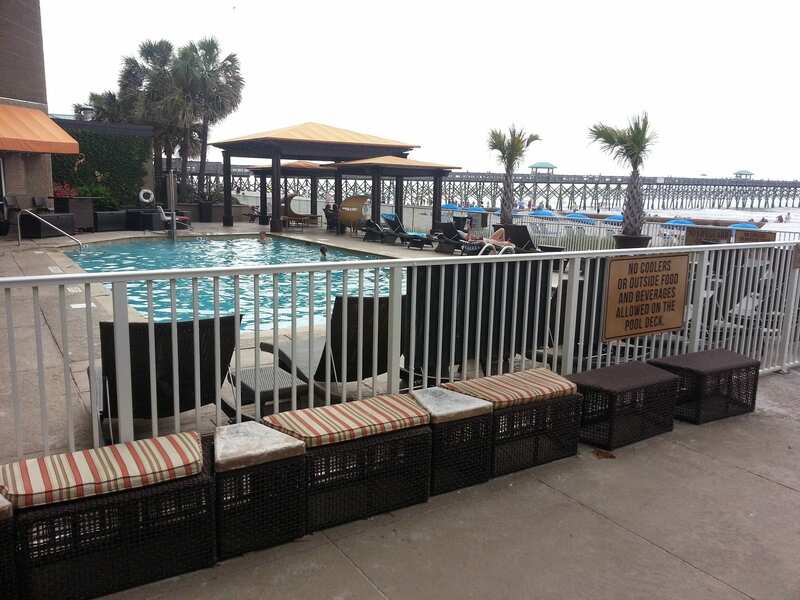 The pool is also very close to the beach, so you can go back and forth with relative ease. The hotel has a restaurant and bar called Blu. Blu is accessible from the hotel lobby, as well as from the beach/pool areas. The inside is nice and modern like the rest of the lobby area, while the outside has a bar and patio. I found the food to be pricey (come on- $6 for a basket of fries?!) but convenient. We received a $5 off coupon for the restaurant via email since we booked online, and I was more than happy to use it. Entrance to Blu from the lobby. Sorry the pic is a little blurry! I was super happy with the beach! We were nervous that the beach would be packed, but it wasn’t! 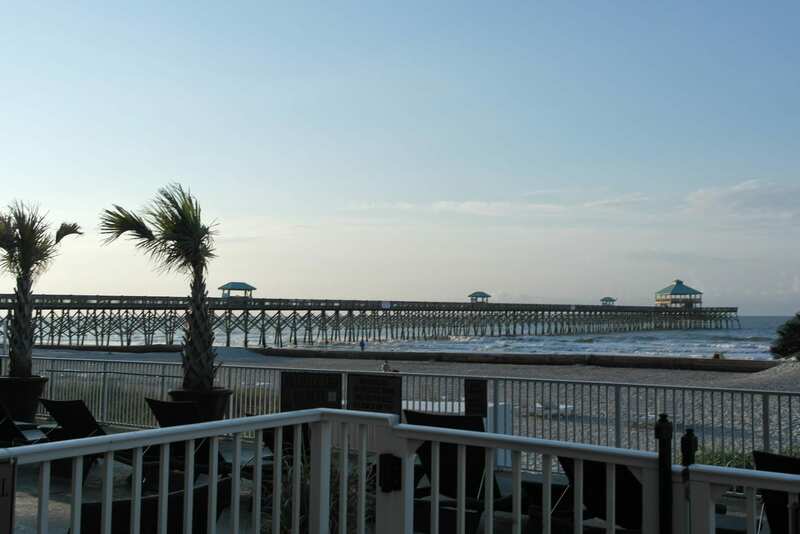 Folly Beach only has the 1 beachfront hotel, and the rest of the beach is lined with smaller condos and houses. We never felt crowded. The beach was very clean with no litter or the like. There was also a beach chair/umbrella/jet ski rental right by the hotel’s pool area, so we were able to rent those with ease. There’s also a fishing pier. We ended up not walking it, but just a heads-up if you want to have that experience. The beach did have a giant pipeline on it (which you can see in the pick of the pier above) that is part of the local renourishment work that is going on. This does not impede your beach experience as they have sand-walkways over the pipes, and there’s tons of beach in front of the pipeline (see picture of Chauncey and I above). UPDATE: PIPELINE IS NOW GONE. I know that at certain points they’ve had some heavy equipment on the beach prior to our arrival, but there was none in sight when we arrived. You can always call the hotel and check to make sure no work is scheduled to be done for the time of your trip. 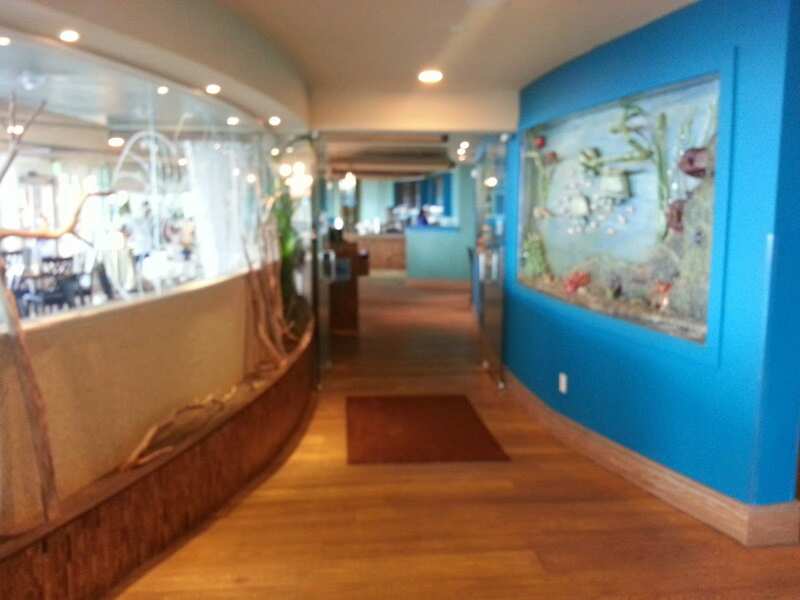 Oh, and if you like to hunt seashells, this is the place for you! The front desk said the best time to hunt for shells is at sunrise and low tide. 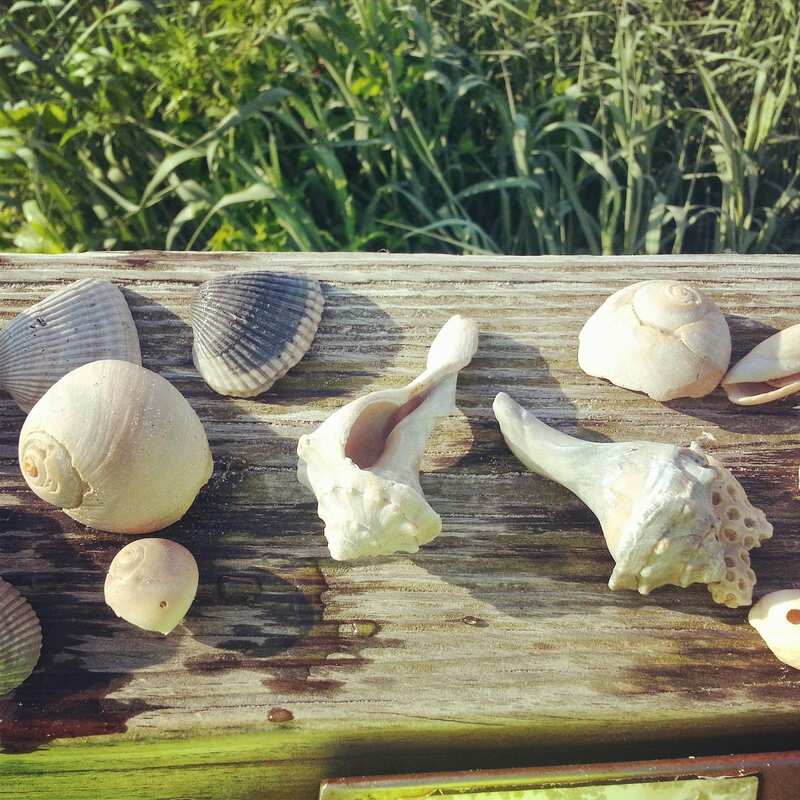 Just a tiny portion of my sea shell haul:) I got tons of shells in interesting shapes! 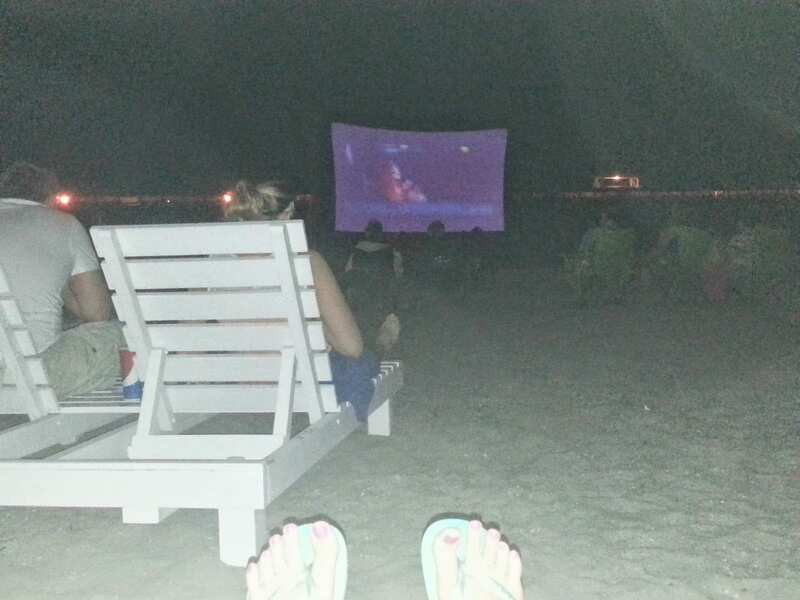 Once a week, Tides brings out a huge screen, some beach loungers, and shows a movie on the beach! They showed Armageddon while I was there, which is one of my all time favorite movies! You could see the screen very clearly, but it’s hard to take a picture like this at night. The restaurants and souvenir shops mostly lined Center Street, and were a quick walk from the hotel. 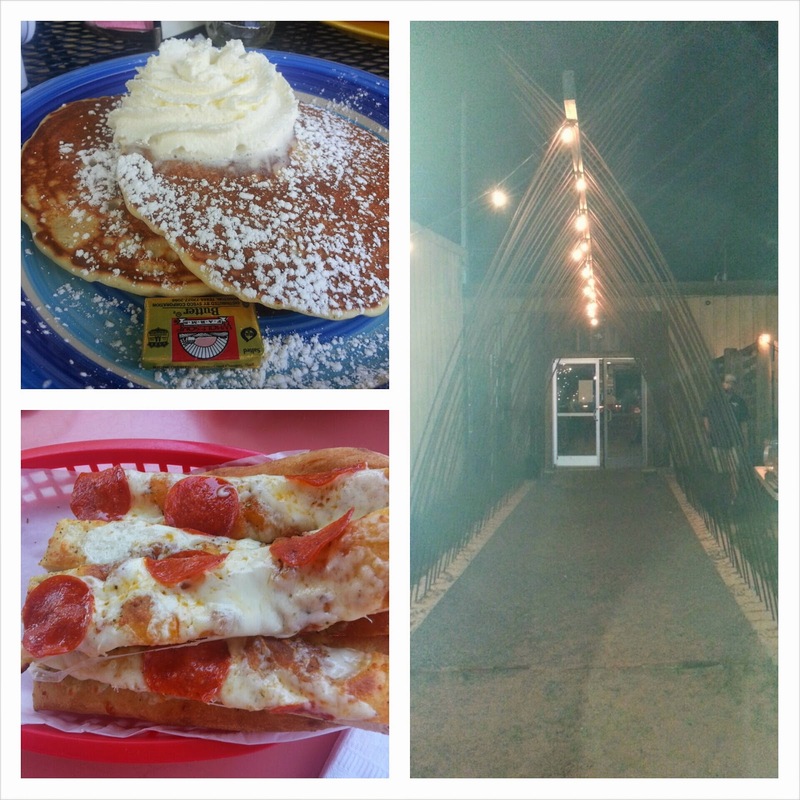 We used Yelp to pick our places to eat, and chose Woody’s Pizza and the Lost Dog Cafe. Woody’s had pizza for $2.50 per slice! Both restaurants were absolutely delicious, and we ate at Woody’s twice. They’re the type of places where you could wear your swimsuit with a coverup. There were several other places we wished we would have tried, including the Wich Doctor. Also, we ate at the Bohemian Bull, which is on Folly Road (which turns into Center Street but is a short drive from the hotel). It has an awesome outdoor area outback and great food! 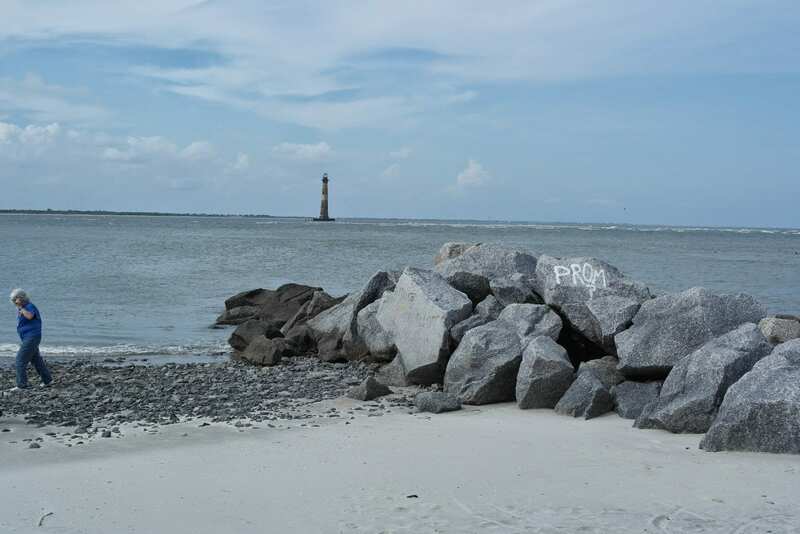 Folly Beach also has its own lighthouse called Morris Island Lighthouse. You have to park and walk a mile to see the lighthouse, and even then it’s not accessible because it sits out in the water. It’s worth the walk, though, because the view is beautiful and you may just see dolphins frolicking in the water like we did! The lighthouse actually has an interesting story behind it, which you can read here. likes this to do a prom-posal? UGH! 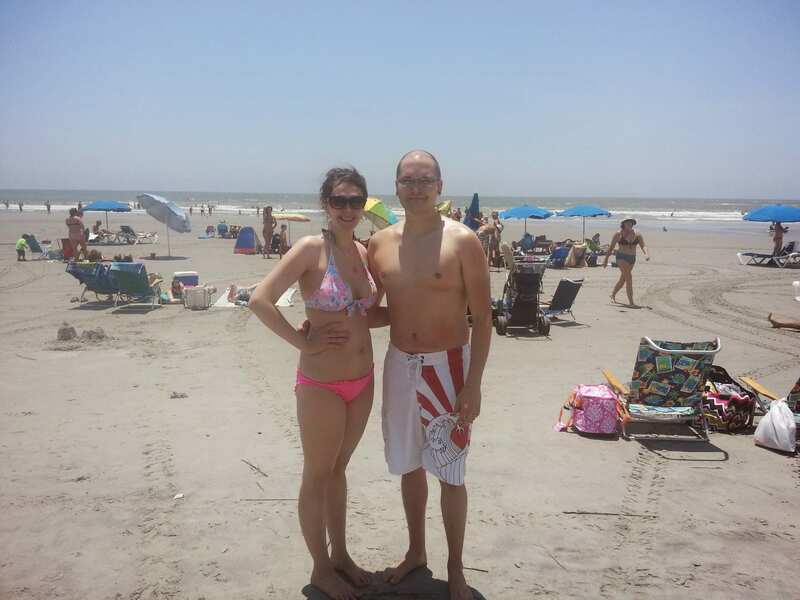 We spent our days on the beach and our nights in downtown Charleston. I am SO glad we took a chance on Tides Folly Beach! It was a fun and relaxing experience without breaking the bank. Vacation is not vacation if you have to worry about how to pay for it after you get home. I enjoyed it so much that I already have a girls’ trip planned for there in September! Click here to read my take on historic downtown Charleston, SC, as well as a review of the Ghosts & Dungeon Tour! Disclaimer: This is not a “professional” review. I travel for fun, and this is my honest opinion of my vacation. All opinions are my own. I paid for the trip myself and wrote this review without prompting. I informed the hotel of my review AFTER the review was already published.